SimpleHelp 5.0 introduces a number of new features and enhancements, as well as a new look. ​This document covers some of the changes in this release. See what was new in the previous release SimpleHelp 4.4. We've improved our user interface components, colour scheme and icons for all SimpleHelp applications. On Windows SimpleHelp now detects the default scaling and adjusts the user interface accordingly to ensure a crisp, well-proportioned user interface, even on HiDPI systems. ​On macOS, icons are clear and crisp on Retina displays. App Tunnels allow you to easily configure port forwarding from the Technician Console. Create tunnels for third party applications and services that securely connect to remote machines over a SimpleHelp session, and automatically launch a client or viewer of your choice once connected. Deploy the remote access service onto Windows, Linux or macOS machines from within the Technician Console. 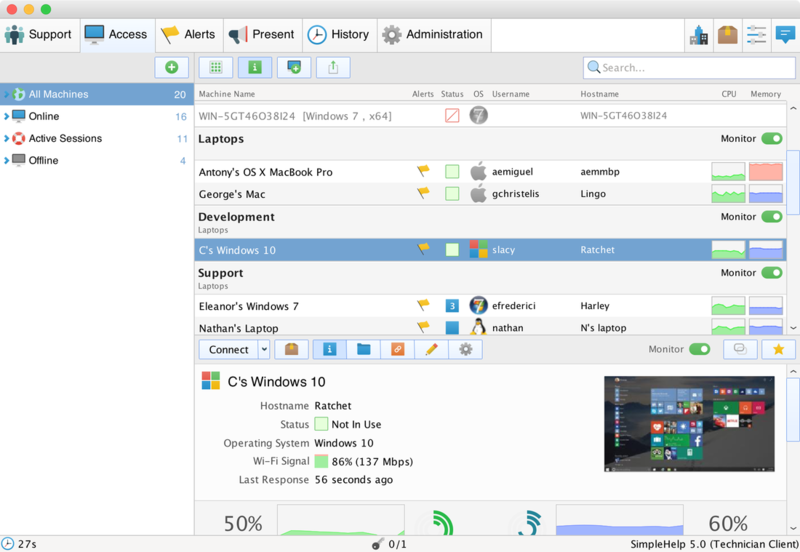 SimpleHelp will install and configure the Remote Access service so that machines automatically appear in the Access tab. The Provider tab allows you to configure customer-specific instances of the remote access service, presentation application or technician console. These applications can be used by your customer to access services via the SimpleHelp server. For example, easily give a customer access to just their SimpleHelp machines without exposing machines in other groups. Use a Tool to trigger or reset an alert, and run the tool on a predefined schedule. SimpleHelp will monitor the tool's return code to decide whether the alert should be triggered. ​Scheduled tools allow you to easily run maintenance tasks on all your remote access machines periodically. SimpleHelp now includes a number of Enterprise-level features suitable for large, distributed organisations. License Server - configure a SimpleHelp server to act as a license server for other SimpleHelp servers. Server Synchronisation - push history items and session tokens from one SimpleHelp server to another. HTTP(S) Clustering - cluster SimpleHelp servers to manage a large number of HTTP or HTTPS remote access services. 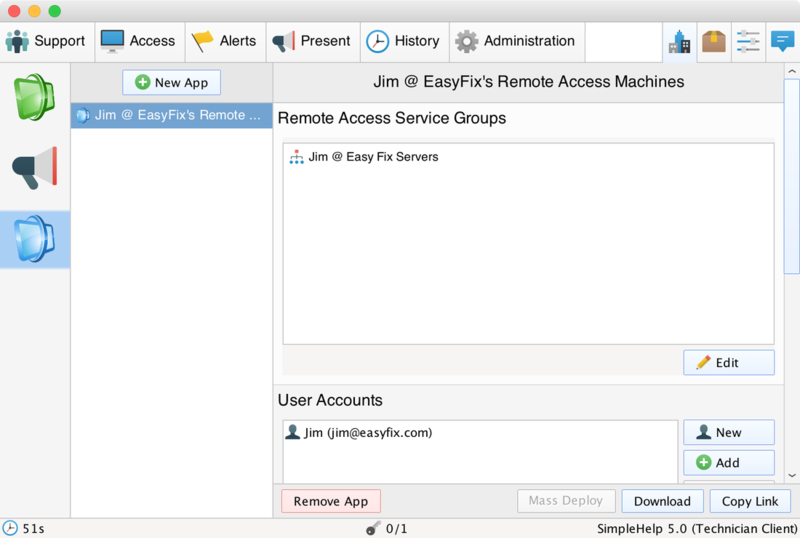 Mass Notify - easily send messages to all remote access machine users from the technician console. Simplified Groups - technicians who are members of multiple groups no longer need to select their login context when authenticating. Simplified Session Types - more intuitive, simpler selection of session types. Improved Typing - better support for SHIFT key combinations and typing in Mobile. Exclusive HTTPS Support - SimpleHelp will now operate in a SSL-only environment.